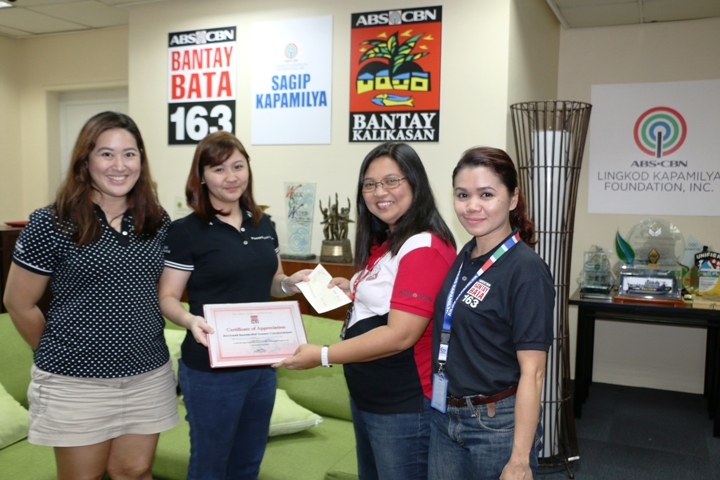 Rockwell Residential Towers Condominium Corporation recently handed a gift of love to ABS-CBN Lingkod Kapamilya Foundation’s child-care program, Bantay Bata 163. In Photo: (L-R) Michelle Buñales, Ira Lamson- Front Office Supervisors, Rockwell Residential Towers Condominium Corporation, Sheila Estabillo, OIC-Bantay Bata 163 and Celeste Apa, Resource Mobilization Officer-Bantay Bata 163 during the turnover of donation. As part of the Lopez Group of Companies, residents of the said condominium initiated a garage sale which benefited the said program as its proceeds were turned over by Front Office Supervisors, Michelle Buñales and Ira Lamson. Buñales and Lamson said that it was their company’s first time to donate and vowed to continuously support the cause of Bantay Bata 163. Bantay Bata 163 , on the other hand, expressed its gratitude towards groups and individuals who ceaselessly support the welfare of the Filipino children.